Dawn Navasie - Contemporary Hopi Jar with Butterfly Designs, 2.5" x 8"
Fannie Nampeyo (1900-1987) - Hopi Polychrome Vase with Migration Pattern, 1950-60s, 6" x 8"
Feather Woman - Hopi Jar, c. 1980, 7" x 6"
Jacob Koopee Jr. (1970-2011) - Hopi Polychrome Jar c. 1990s, 2.5" x 7.75"
Leah Garcia Nampeyo (1928-1974) - Hopi Polychrome Jar with Migration Pattern c. 1960s, 5.75" x 9"
Loren Ami - Hopi Ladle, c. 1996, 9.75" x 2.5" x 3"
Nyla Sahmie Nampeyo - Hopi Polychrome Geometric Design Vase, c. 1998, 10.25" x 6.5"
Steven Lucas (b. 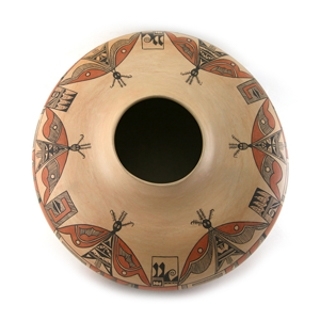 1955) - Hopi Polychrome Jar "Eagle Dance" c. 2004, 4.5" x 7"
Steven Lucas (b. 1955) - Hopi Polychrome Jar "Winter Ceremony" c. 2004, 4.25" x 7"